For some people, road trips equal getting stuck in the car for what seems like forever, whereas, for others, the idea of a journey gets them excited and ready to hit the road. Road trips by car can be a blast, or they can be annoying and tedious endeavors. However, with a little bit of preparation, you can make sure to have the time of your life while on these trips. Here are a few tips to help you relax while you enjoy your road trip. According to CarCareNinja, one of the best ways to relax while on the trip is to take some time to pull over and explore beautiful scenery. Get out of the car, breathe in some fresh air and stretch your muscles. Take a few minutes to stroll a few meters away from your vehicle before getting back on the trip. You will return to your journey feeling happier, more relaxed, energized and with beautiful memories of the impressive sceneries or crazy waterfall you have discovered. Also, view our article on Cape Town driving lessons and k53 tests. According to some studies, scents from essential oils like lavender can help ease anxiety, control blood pressure and help you calm down when stuck in traffic or crossroads with inconsiderate drivers. If possible, plug a car aromatherapy diffuser or air freshener into the lighter vent to blow out the stress-busting scent through your car. Always think about exhaustion before you begin your trip than while at it. Before starting your journey, get at least seven hours of uninterrupted sleep for two consecutive nights to build-up energy reserves. Also, avoid driving between 1 and 3 p.m. when most people are naturally drowsy. You should stock up your water supply for maximum energy. However, plan to make more bathroom stops. Sitting upright ensures your body is tilted for maximum blood flow. Adjust your seat correctly, take a deep breath and scan your body for any tension. If you discover, for instance, that your right hip is feeling sore, try to lean on the other side. According to a populous survey of 2,000 drivers, turning on classical or pop music when driving can help you become more calm and relaxed. So turn on the Mozart effect to make your road trip an even better one. It is a known factor that technology can easily increase your stress levels and affect your health negatively. A lot of people spend most of their waking lives plugged into technology. Taking some time off technology during your road trip can help you relax and enjoy a more pleasant trip. Avoid checking your emails, Facebook, Twitter, texting friends or even making calls. Try to power down your phone, at least until you get to your destination. This is perhaps one of the essential tips for relaxing and enjoying a road trip, but still one of the most difficult to achieve. When most people plan their holidays, they want to do all the research, eat in all restaurants, see all the sights along their road trip route and have all the fun. However, all these plans can increase your stress and anxiety instead of having a relaxing road trip. Remember, you only have some limited time during this trip. Hence, prioritizing what you really want to see will buy you more time to enjoy the journey. In fact, as you schedule for the trip, put aside some time to relax. 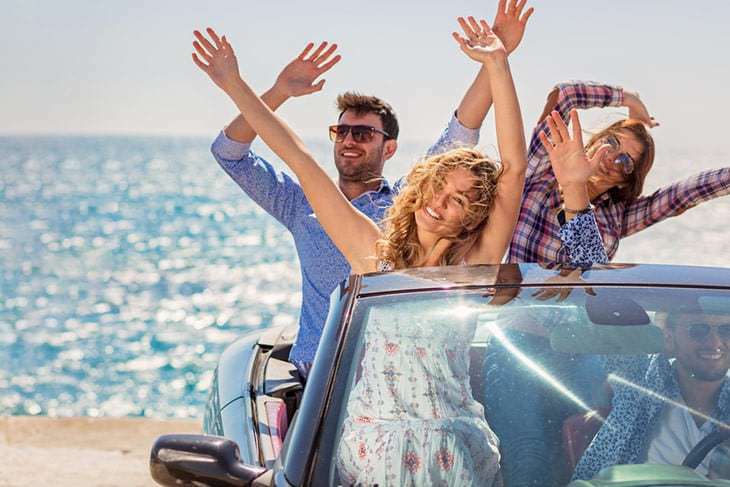 You can choose to unwind when the temperatures are soaring, by lounging at a pool in your rental property and continuing with the road trip afterward. Some people, no matter how much you love spending time with them are just not meant for road trips. Such people can add up to your stress level, making the road trip extremely unbearable. Find a travel partner who enjoys similar things as you. The key here is to avoid disagreements during the journey that can lead to stressful situations as much as you can. You can even opt to ditch companions and go alone. When you travel alone, you are free to do anything you like and on your schedule, whether it is hopping from museum to museum all day long or driving throughout the trip while listening to your favorite band or podcast. Make sure you check out our article ’10 Tips for the Best Car Insurance‘.